The new coordinator for Martin’s Cards is Ellie Crognale (crognalefamily@comcast.net). A great big Cub Scout THANK YOU to Kelly Thimmesch for handling this project for our Pack! Sunday, April 21 at Deer Park Park & Rec. Tiger Fun Day is for all Tiger Cubs, their families, and their friends. More information will be sent as it arrives from the District. Mrs. Morey (from Troop 883) is handling registration for this event. Please provide a copy of this registration form + your payment (checks should be payable to BSA Troop 883) by the May 13 Troop Meeting. 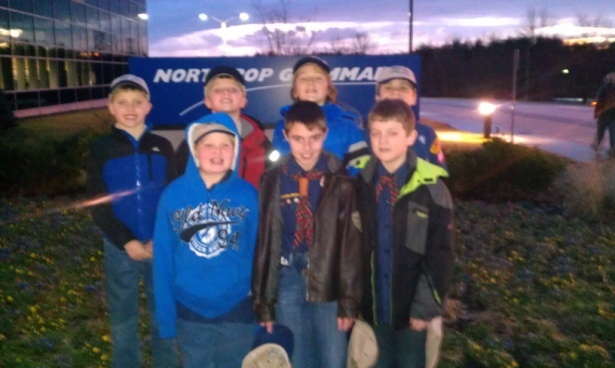 Webelos 1 Den 8 completed their Engineering Webelos Activity Badge requirements in February by visiting the Northrop Grumman Electronic Systems facility adjacent to the BWI airport. During their visit, the Webelos received a tour of the production line where they learned about how engineers design, manufacture, and test radar systems for the F-16 Viper, F-22 Raptor, and F-35 Lightning II aircraft. They spoke with a manufacturing engineer who explained how radar systems work and the different types of engineers that are needed to build them. The highlight of their tour was a visit to the Flight Test hangar where the boys had the opportunity to speak with an Engineering Test Pilot, learning about what it takes to become a test pilot and seeing firsthand the various types of experimental aircraft that are used to flight test radar systems. Back row – Garrett, JR, Ryan, Shane. Front row – Hunter, Danny, Josh.